Welcome to language-easy.org! Well, as you have clicked in this article, I suppose that you want to enter the depth of German grammar. So, you have chosen a very essential part of this language, the German participles. 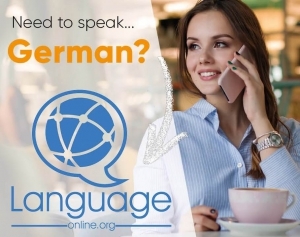 For sure, you know that it is very important to understand the forming and usage of German participles, as they are needed to build a lot of different German tenses and moods. Furthermore, you should know that there are even two types of German participles! Well, don’t worry – it might take some time, but you will master this topic faster as you might think. In the following, we will have a detailed look at the two different types of German participles. 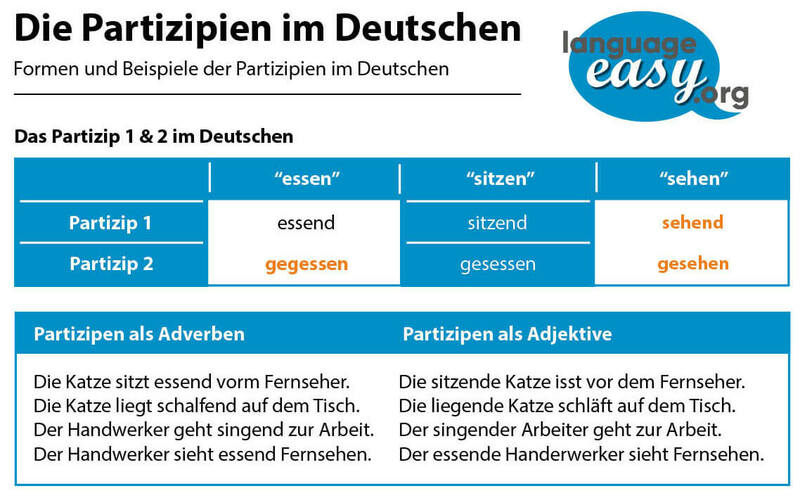 First, we will try to clear up, what German participles actually are and define the two different types. After that, we will talk about the usage and, of course, their conjugation. So, let’s not loose to much time and start right ahead! By the way, in case you want to get some background knowledge about German participles, just have a look at this article on Wikipedia. Well, in this first part of the article we will have a more detailed look at the two different types of German participles. Additionally, we will also talk about their correct usage. First, instead of a sentence clause for one of two simultaneously occurring actions. “Hupend fährt das Auto fort.” – The car drives away honking. “In einem fahrenden Boot fischt ein Mann.” – In a floating boat a man fishes. Now, let’s come to the next type of German participles. So, this second type of German participle can be compared to the past participle in the English language. Actually, its usage should be quite clear to you. Nevertheless, we will talk about it in the following. Of course, the past participle is a little bit more complex in its usage. “Mit den Nachbarn geredet, weiß Frau Schmidt nun bescheid über alles.” – Having talked to the neighbors, Mrs. Schmidt knows everything now. “Deshalb staht das geklaute Auto dort!” – That’s why the robbed car stand over there! Third, you have to use this type of German participles in compound tenses. Well, the following tenses include the past participle: Present perfect, past perfect and the future perfect. Fourth and last, it is very important in the passive voice. “Mein Auto wurde gestern gestohlen.” – My car was robbed yesterday. Well, I think we have cleared up what the German participle is and also talk in detail about its correct usage. Now, let’s come to another important part of this article, the conjugation of German participles. Luckily, there is a simple rule you can follow when you want to form this type of German participles. So, here you are. Well, quite easy, huh? So, let’s make it even more understandable and have a look at some examples. Now, let’s have a look at the formula for the second type of German participle. Well, it’s a little bit more complicated that the formula for the present participle, as you have to distinguish between weak and strong verbs. So, here are the two formulas. So, let’s come too the sweet part of exceptions. Actually, we can also split them up into exceptions for the present participle and exceptions for the past participles. First of all, I’d like to mention the only exception for them German present participle. Simply keep in mind, that you use an extra “e” before the “n” in case you use the forms of “sein” (to be). Actually, that’s quite easy I think. So, let’s come to some more exceptions, which all apply in the past participle. First, many strong and mixed verbs change their stem in the past participle. Second, if the word stem ends in “-d” or “-t”, we add an extra “et” to weak and mixed verbs. So, here is an example. Third, verbs with the ending “-ieren” form the past participle without “ge”. Fourth, inseparable verbs form the past participle without “ge”. Fifth and last, with separable verbs, the ge goes after the prefix. Well, I think we came to the end of this article about German participle. Actually, it wasn’t too difficult, huh?